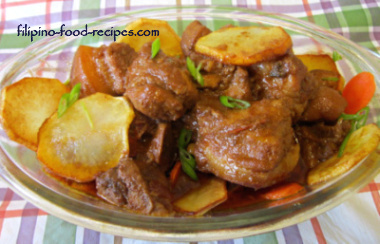 There is not one standard Filipino Asado recipe that you will find anywhere. Unlike Adobo which is basically vinegar, garlic and soy sauce, Asado is a dish with so many variations. Some Filipino recipe books even number the Asado recipes they have, from savory to sweet, and you get to pick which one you prefer. 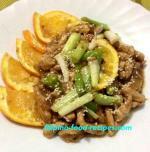 The recipe below is a usual Kapampangan asado --savory rather than sweet. Tart from the lime or calamansi juice, mildly salty from the soy sauce and partly sour from the tomatoes, and served with potatoes. What's the difference, then, with the Afritada? For one, this doesn't use bell peppers, so that distinct sweet taste and smell of bell peppers is not found on this dish. The pronounced flavor here is that of the soy sauce and lime juice rather than the tomatoes, unlike that of the Afritada. The side vegetable is thinly sliced potatoes, which my mom fries to retain their shapes and so they don't get mushy if boiled in the sauce. Also, we saute in achuete oil to get that appetizing red color, a step which is totally optional. 1 Marinate the pork pieces in soy sauce and lime juice, set aside for 15 - 30 minutes. 2 Fry the potatoes and carrot slices, then set aside. 3 When done marinating, start to saute the garlic, onion and tomatoes in the achuete-infused oil or regular cooking oil. 4 Add in the marinated pork (without the marinade), and cook until the pork is browned, about 15 minutes. 5 Pour the marinade and broth and simmer until the pork is tender and the sauce has thickened. 6 Season with pepper, and salt, if needed. 7 Top with the fried potatoes and carrots(and green onion), and serve hot with rice. This is a dish that we usually cook when we have no other ingredients or sahog available, because most of what we put in are readily available in the pantry -- all we really need is the meat. Other versions cut the potatoes in quarters rather than thinly, but this would make the dish look more like Afritada rather than Asado, but it's your choice. You could skip the frying of potatoes and carrots and simmer them with the pork if you are not too particular with the potatoes being too soft or getting mushy in the sauce. Sauteing tip: once you add in the meat after the garlic and onion, try to cook the meat until almost browned before adding in the flavoring sauce. A totally versatile dish, you could make a variation by using chicken or a mixture of chicken and pork, or even beef with this Filipino asado recipe.